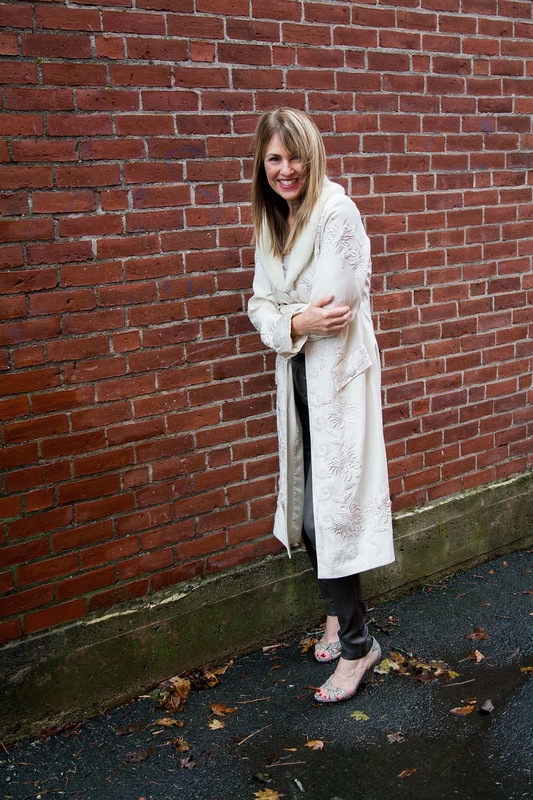 I always have the BEST time over at Chic Consignment! So when May invited me back for a holiday photoshoot, I couldn't wait! May is the owner of Chic, and boy can she whip up an AMAZING outfit. Like a great chef, she throws in a little of this and little of that--and out comes a masterpiece! She put together three holiday looks that will take you from an office party to a home gathering (while stopping traffic). Everything shown here (if still available) can be purchased at the Andover, MA store or shipped directly to you. First up is this stunning black and white ensemble. I feel so classy and sophistacted in this outfit! 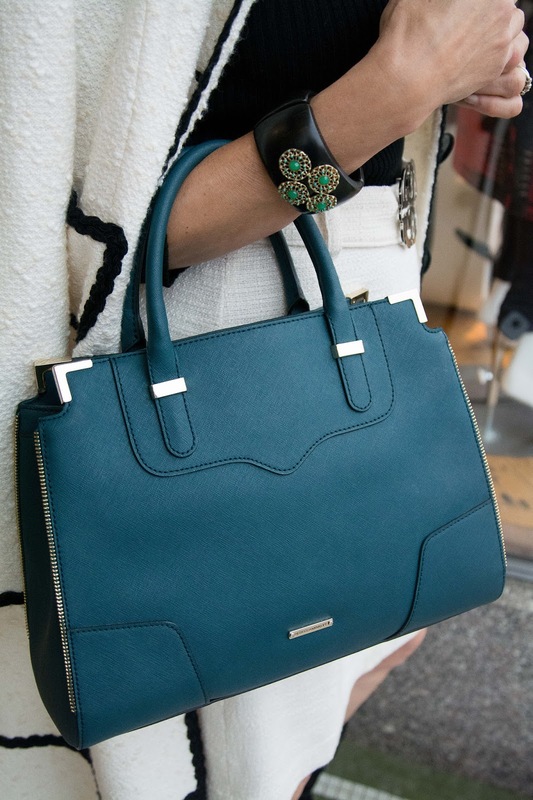 And don't you love the color of this Rebecca Minkoff satchel? These Georgina Goodman three buckle boots are sooooo amazing! size 2 $399. and a White House Black Market metallic champagne bustier size 0 $25. 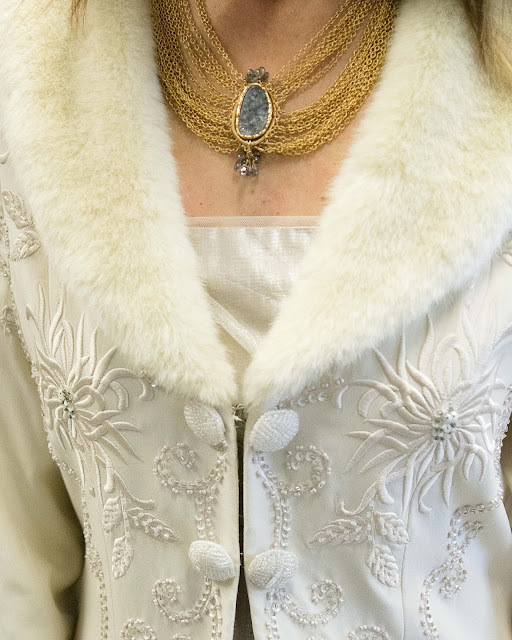 I kind of feel like an edgy version of The Snow Queen! 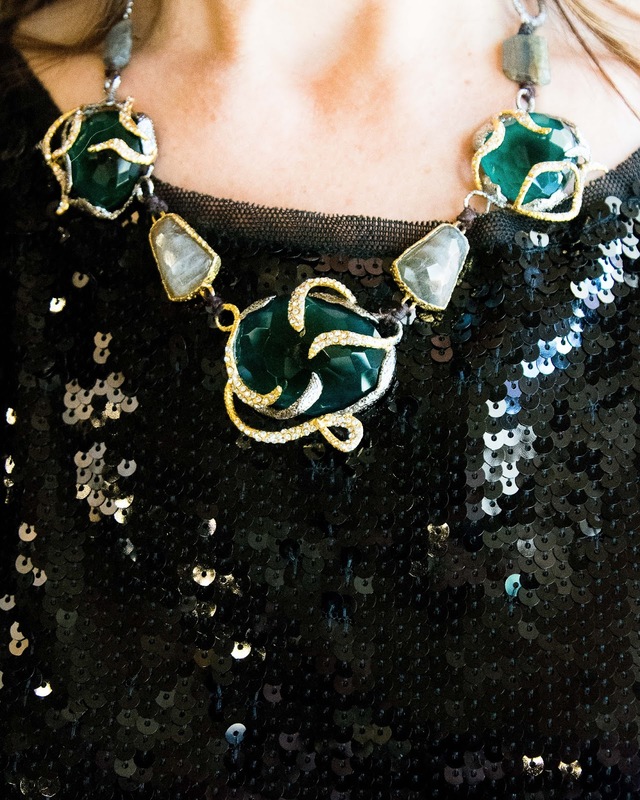 And off you go to a festive event! Last up is a little more "casual" look. I met a few cuddly friends. This guy was definitely not into having his photo taken. And then came these two cuties! I enticed them to walk with me by giving them treats. It seemed like a good idea until they started pulling me down the street in heels! 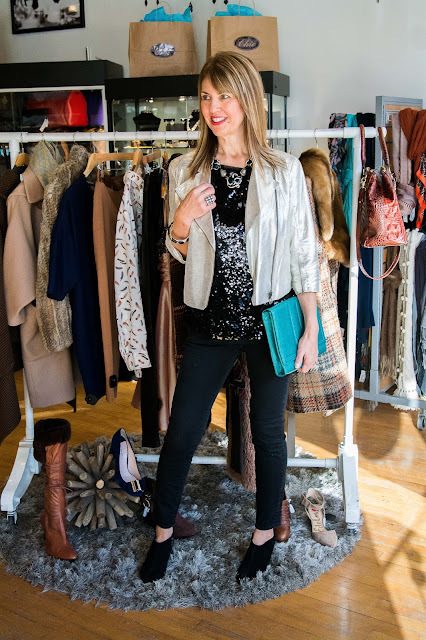 This incredible Robert Rodriguez metallic leather jacket is such a gorgeous neutral color and perfect for the holidays! 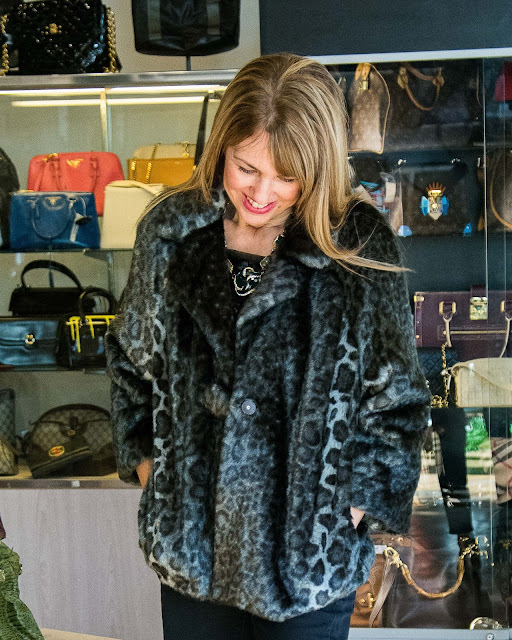 And then this cozy Kate Spade cheetah print faux fur jacket XL $129 Who can resist faux fur? Not me! And to sweeten things up even more, Chic will soon be launching an e-commerce site! So follow them on Facebook and Instagram to stay updated. Thanks for stopping by--hope you're enjoying the holiday season! Chic Consignment sponsored this blog, however the content of my posts are based on my own honest opinions and are not in any way influenced by partnerships. I only post what I love! I love this post! That long coat about made me faint! I love all these looks and am a big fan of shopping consignment. 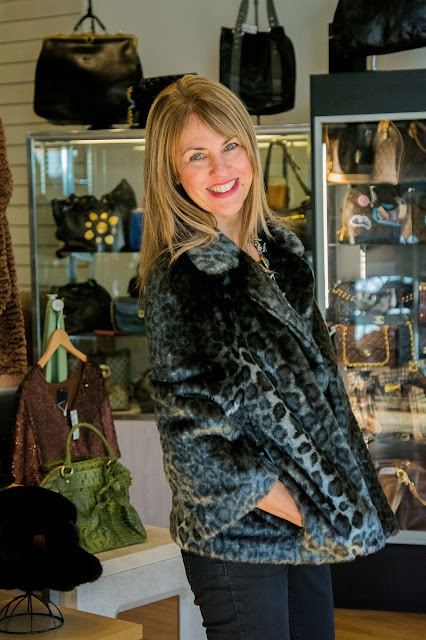 I have a couple of beautiful fur jackets and a red leather jacket all from consignment stores. Happy Friday! I am loving your dressing sense.Nice post.On my up-coming event i am thinking to wear this same dress.Good post.Your dressing pictues actually insisted me to read your blog. I tell you, I knew it!! It’s a huge pile of photos here! But my favorite ones is where you are with dogs and in front of blue door. Photos with dogs are remembering me casual frames from old Rock music videos. On other hand, photo with blue door is very similar to British classic – Doctor Who’s Tardis. If you remember new Doctor Who is a woman, so it’s very trendy! How to spend those gift cards!